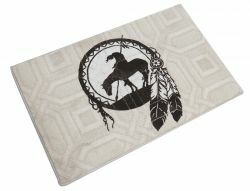 Standing Horse Welcome Design Outdoor Door Mat. Pleasure Horse Welcome Design Outdoor Door Mat. 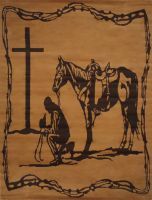 Praying Cowboy Welcome Design Outdoor Door Mat. 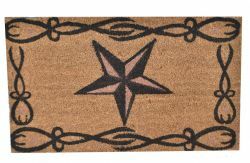 Barrel Racer Welcome Home Design Outdoor Door Mat. Running Horse Welcome Design Outdoor Door Mat. 27" x 18" " The End of the Trail" floor mat. 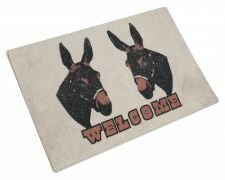 27" x 18" 2 Mules Welcome Mat. 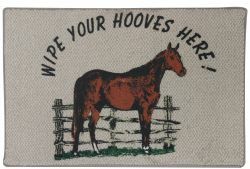 27" x 18" " Wipe your hooves here!" Welcome mat. 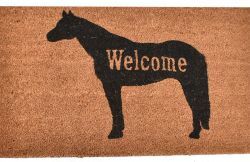 27" x 18" Welcome mat with standing horse. 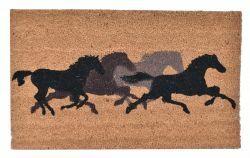 27" x 18" Running horses Welcome mat. 27" x 18" Welcome Home mat with running horse. 27" x 18" " Caution, A crazy horse lady lives here" Welcome mat. 27" x 18" " Howdy Y'all" Welcome mat. 27" x 18" " We don't call 911" Welcome mat. Large running horse rug. 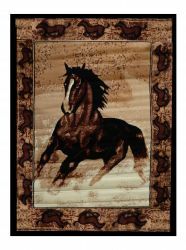 This rug features a running horse center and is accented with a running horse border. Measures 5' x 6'5". 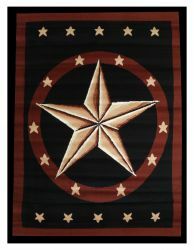 Large western star area rug. 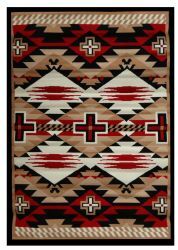 This rug features a large western star in center and is accented with a red and black border Measures 5' x 6'5". 27" x 18" Boots ' N' Spurs welcome mat. 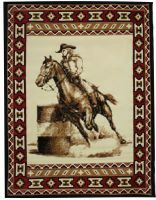 Large Barrel Racer Area Rug. Measures 5' x 6'5". Large Praying Cowboy Area Rug. Measures 5' x 6'5". 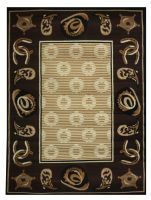 Large western style area rug. Made of 100% Olefin materials. Measures 5' x 6'5"